(Description by C. Conrad) Black metal has long been a vehicle of choice for an individual to express oneself independently and solitarily, albeit with differing degrees of success depending on the quality of the artist’s songwriting ability and musicianship. When these two attributes are of a higher caliber, a one-man entity completely devoid of the potential need to compromise his vision with those of a group of collaborators can flourish. Perhaps it is for this very reason that IV, the lone member of Ill Omen, has again succeeded in creating some of the most resonant black metal of recent times with “Æ?.?Thy?. ?Rift,” the band’s third full-length album and its fourth release on Nuclear War Now! Productions. As with Ill Omen’s previous output, “Æ?.?Thy?. ?Rift” exudes an organic continuity within each song and across all tracks on the album, which is an outcome often not realized when multiple songwriters and musicians are employed. This consistency is achieved by the implementation throughout of dual bass guitar layers (one clean and one distorted), notably skeletal percussion, the churning, choir-like atmosphere of tremolo-picked guitars, and a blend of chanted, whispered, and traditional black metal vocals. The singularity of this release is further cemented by the lack of distinction in track titles, a characteristic which serves to present the album as a sum of inseparable parts. In other words, and especially given the ritual-like quality of the record in its entirety, it is safe to interpret each track as a necessary component of a collective opus whose individual pieces were not created with the ability to sustain themselves independently of the work as a whole. 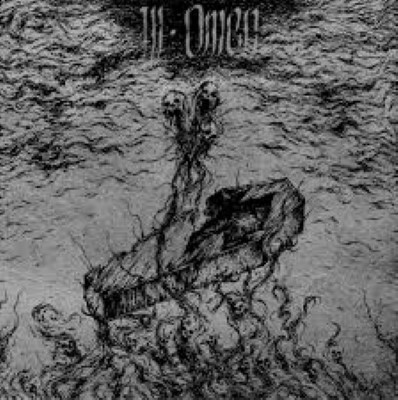 What most readily sets this particular release apart from previous Ill Omen recordings is a more dedicated adherence to slower, more doom-oriented tempos, which are very well suited to this ceremonial variety of black metal. The listener may very well be left with the impression that this is the soundtrack in the mind of a disease-ridden being on its deathbed, at times feeling an almost celestial bliss at peace with the impending end of suffering, but at other times tormented by the physical and spiritual decay that will inevitably lead to its ruin.